Would you wear a charity shop wedding dress? With the 'average' price of a wedding gown topping £1,000, it's no wonder that brides-to-be are searching for affordable alternatives. One option is to look in charity shops. Some of you will recoil at the idea of wearing a secondhand wedding dress, but not all wedding dresses in charity shops are secondhand. Some are unworn, donated by individuals, others are end of line from the makers. Personally, as I wear vintage clothing, it really isn't much of a stretch to imagine myself in a secondhand dress. 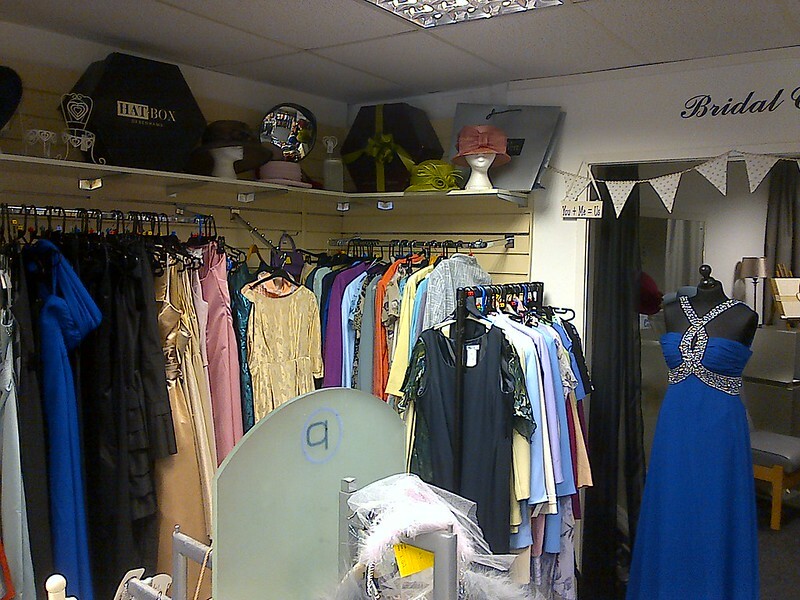 The dress pictured above was in Tenovus on Cardiff's Whitchurch Road recently. They were only asking £50, and it's brand new, never worn, still with the tag inside. I did try it on but alas, my ample derriere prevented me from zipping it up! Also, I have a feeling that it was one made in China, as I recognise the style from some on Ebay and Etsy. The quality was reasonable, but not high. Many charities will have a specific bridal store, where they send all of their wedding dresses, or they may have an online boutique like Oxfam does. 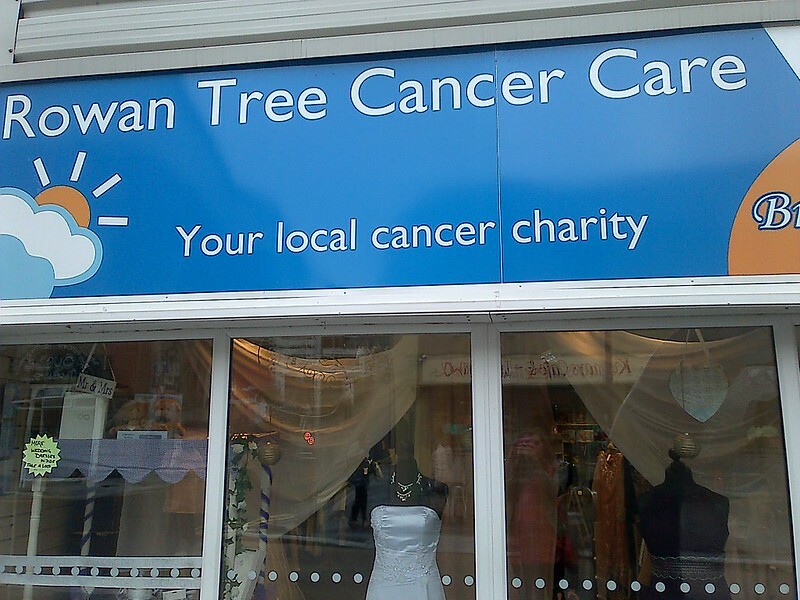 In Pontypridd recently, I came across Rowan Tree Cancer Care, a local charity that has an entire wedding 'boutique' within its store, including a rail of wedding dresses (from £100), a few rails of bridesmaid and prom dresses, and a rather large selection of hats, veils, faux fur shrugs and other accessories. Men weren't forgotten either, with a few rails of suits, shirts and waistcoats. I have compiled some tips for getting a charity shop wedding dress, as there are a few things to factor in. 1) You stay open-minded. If you have a particular designer in mind, then you might be disappointed. 2) You have sewing skills. Being able to examine the construction of a dress and see what can be done is really helpful in reimagining what a dress could be. Lots of 1980's dressses have perfectly good skirts and bodices, but it's the sleeves and embellishments that date them - try and see past them, at what you could do with that wonderful fabric. Perhaps turn a 1980's dress into a 1950's style tea-length dress? 3) You go regularly. This helps you to spot things first, but also to get to know the staff, who are then more likely to give you a phone call when something comes in. 1) You're an unsual size/height. For example, you might struggle if you're a very petite lady with a large bust, or perhaps you're very tall - most dresses I've seen in the charity shops are for pretty 'average' figures and builds. You could get lucky, but the odds are not as much in your favour! 2) You want something very specific. It really is the luck of the draw. Of the ones I saw in the Pontypridd shop, most were of the same style - a sort of corseted top section with embroidery, and a fairly full skirt. 3) You don't have much time. It does take a lot of man hours to trail the charity shops! 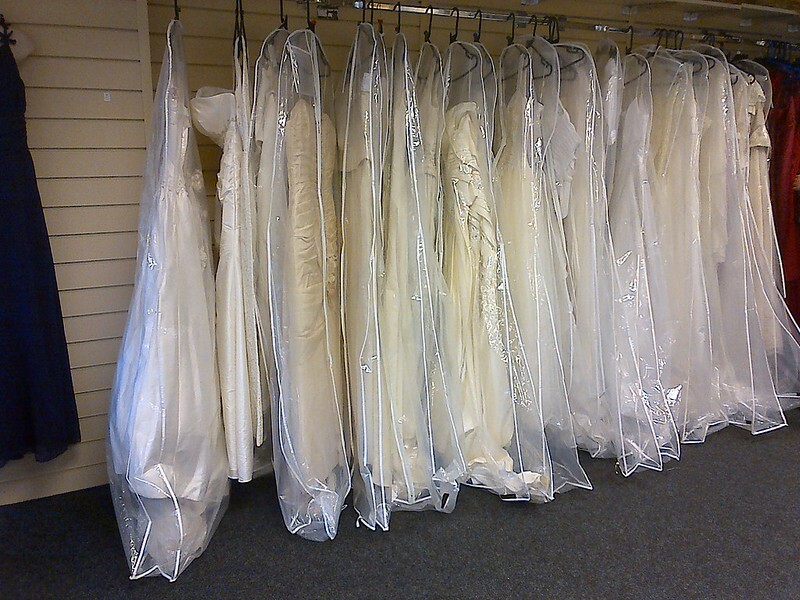 Have you had any success with a charity shop wedding dress? Or does the idea give you shivers? I'd love to hear what you think! I'd have zero qualms wearing a thrift/charity shop wedding dress, assuming it hailed from a decade (or had the look of one from) that was near and dear to my heart. When Tony and I tied the knot a decade ago, we had an incredibly small scale, informal civil ceremony wedding and I didn't wear a traditional bridal gown. We hope to have a vow renewal ceremony one day and when we do, I'm definitely going to wear a vintage wedding (or wedding appropriate) dress for that. If I can luck out and find it in a thrift shop, all the better (because it will mean I can actually try it on in person, instead of just taking a gamble on the fit front with an online purchase). Mine wasn't charity shop, but it was vintage and so cost £85. I'd been hunting for something completely different but fell in love with the one I bought as soon as I saw it. 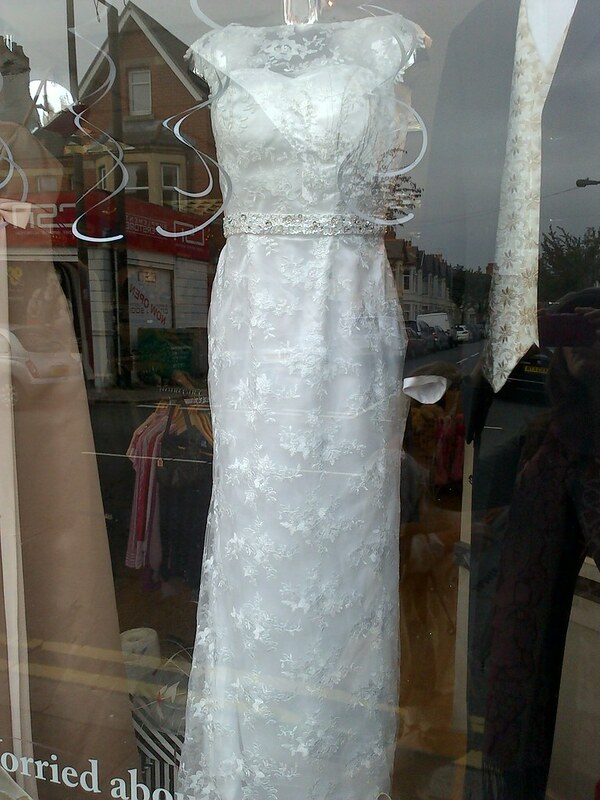 I feel sad to see wedding dresses in charity shops, but I suppose they're not really re-wearable things in most cases, even with a dye job. Here you go! 30s ivory silk. I'd been looking for a 20s style one as I was VERY into all things 1920s back then, used to swap 20s mixtapes with a goth friend (mixtapes; ye gods that puts a date stamp on me!) but after seeing this I had to have it. Investing in a second hand dress is a fantastic idea and I great way to save if you have a small wedding budget! These are great tips. I spent so much time looking for a wedding dress. I didn't want to spend a ton of money on a dress. Shortly after my engagement I went to a couple bridal shops to try on some new dresses. While I found several I liked none felt right or were in my budget. Hours were spent searching Etsy and Ebay. In the end I made my own dress, as well as a second shorter reception dress. (I'll be posting pictures on my blog soon!) If any of our local second hand shops had anything that fit I would have purchased a dress and saved myself the headache of making one! I started at charity and consignment shops when I was looking for a wedding dress. I found out that most that were true "second hand" as in worn in a wedding, were usually from the 80s, but most contemporary dresses were never worn, and a bride bought it, thinking it was the one, only to come across another dress she liked more later. But after searching and searching at second hand, charity and even vintage shops, I found nothing to my liking. One day I randomly spotted a bridal shop with my mother, and we decided to pull in, and I found mine in the, as you mentioned, end of the line, area - an area mixed with now "out of season"/end of line gowns, as well as samples, where what you find is what you get - similar to a second hand experience. Luckily I found what I wanted, and it fit so perfectly it needed no major alterations! I only requested the haulter be brought up a bit, as I didn't like how low it was, and for them to put in the necessary hooks and loops for a French bustle. And it only cost me $300 total! Ironically enough though, just three weeks before my wedding, I found a vintage late 50s-early 60s tea length lace wedding dress at a friend's vintage shop, and once again, it fit like a glove, and I bought it to change into after our first dance, that dress cost $75. So it CAN be done second-hand and it CAN be done cheaply! I wish you all the best on your search! I love the neck of the dress you spotted in the window, shame about it not fitting! What a wonderful price! i was never into wedding things and wedding dresses. it's just not my cup of tea to spend thousands of €s for just one day. but when i came to the point to get married, i was looking for a little dress that was totally me. i found my dress by chance on ebay - i actuallly won another 40s dress and checked the other auctions of the seller ... there it was, a beige lace dress from the late 40s/early 50s. i bought it for 30€ incl. shared shipping costs (because of the otgher dress i won). my dress isn't an actual wedding dress and i'm happy about it! i hope i will find an occasian to wear it again. i wear vintage every day, pieces i found on flea markets, in thriftshops or online - i'm used to wear 'other peoples old stuff' - why should i wear something new to my wedding? I'd have no problem with wearing secondhand myself, but mine was made for me as a wedding gift, that way I knew it'd be long enough for me. Have really enjoyed looking through you blog today! I have just done a blog post about my wedding, although my dress wasn't a second hand, the rest of the day is all hand made, mainly by my mum, so really cheep and personal! I would absolutely wear a second-hand wedding dress - in fact, I'm planning on it. Granted, we're not quite there yet, but sometime in the next couple of years we probably will be, and there's no way I could bring myself to spend $1200 on a dress I'll wear once in my life. I'm actually already checking out styles that I like on Etsy. It's not quite the bargain that a dress from an actual thrift store would be, but it's still much cheaper than looking at new wedding dresses from your average bridal shop.